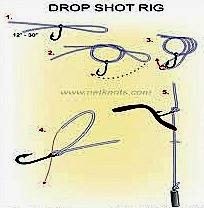 Article #1: “The drop shot rig is a relatively recent innovation in the freshwater fishing realm that is now making its way to saltwater. Named for the way the rig goes straight to the bottom, it is similar to a ‘fish-finder’ or ‘chicken’ rig currently used by many bottom-fishing anglers. The difference is in the placement of the hook…. Article #2: ”Start by tying on the hook using either a Palomar or Clinch knot. Leave the tag end the length you want the worm to be off the bottom. Start at 16 to 20 inches up the line unless you see fish suspended a certain distance off the bottom. If you do, tie the hook that distance up the line. ”When you tie the hook on, bring the tag end back through the eye of the hook from the top down, that will make the hook stand out straight. Make sure you pull your knot tight when tying it.